My heart immediately went out to this nameless teacher who was clearly in a tough situation and needed some help figuring out what to do. My heart went out to them because I know what it’s like to feel like you’re not in control of your classroom, to half dread walking into it because you know things probably aren’t going to go the way you want them to. 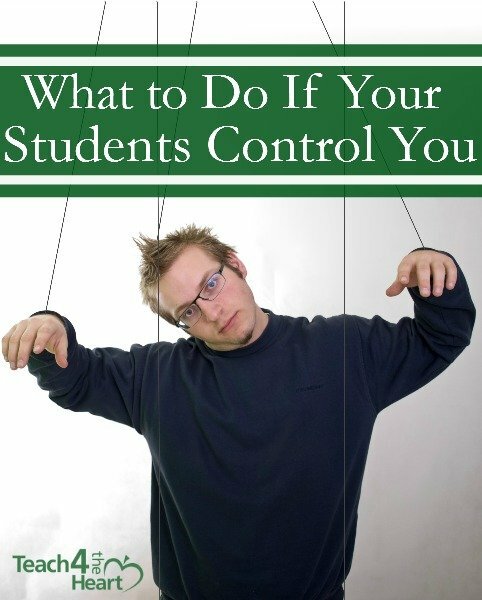 So to anyone else out there who feels like their students control them – or at least feels like their classroom isn’t as controlled as they’d like it to be – here are some suggestions to help you get back on track. Take responsibility for your classroom. The first step toward regaining control over your class is to realize that you can. You need to believe in your heart that controlling your classroom is your responsibility. If you’re blaming the students or the circumstances or anything else, all you’re doing is giving yourself excuses not to change. The truth is that you CAN control your classroom with the right techniques and attitude. So start by believing in yourself and accepting responsibility for your classroom. Ask a fellow teacher for help. If you’re in the middle of the year and things just aren’t going well, ask a fellow teacher or an administrator to watch you teach and give you suggestions for how to improve your classroom management. Decide what you will expect. Sit down and make a list of how you want your students to behave in your classroom. This is not a list of rules you’re going to give them. Instead, this list is to get everything clear in your own mind of what you will and will not accept. Decide on appropriate responses/consequences. Now that you have your list of expectations, plan how you will respond each time a student does not meet those expectations. Will you give a warning? What consequences will result from each infraction? If you don’t know what’s appropriate, ask a fellow teacher for guidance. And check out my article “How to Calm a Disruptive Class” to see how I dealt with the common classroom issue of talking out of turn. Practice your responses. Now that you know how you’re going to deal with various issues, you need to build your confidence by practicing your responses out loud. So stand in front of a mirror and practice exactly what you will say. Practice it until you feel confident that you know what to do in each situation. If you are trying to regain control of your classroom in the middle of the year, definitely have a talk with them right at the start of class. Apologize for not being consistent in the past and tell them that there will now be new rules and expectations and new consequences for misbehavior. Stay consistent. Once you’ve addressed that first issue, stay consistent with addressing the second, third, fourth, etc. Your students may complain, but that doesn’t matter. Just keep responding with your practiced response and give out your planned consequences as needed. Check out Whole Brain Teaching. Whole Brain Teaching can be a fantastic tool to engage your class and help you keep their attention. Check out this video to see how it works or grab a copy of Chris Bifle’s book Whole Brain Teaching for Challenging Kids. Keep learning. These steps will definitely help you improve your classroom, but don’t stop here. Keep reading and learning because there are so many more factors that go into controlling your classroom and being as effective as you can be. I’ve written about many of these factors in my book Create Your Dream Classroom, which will guide you in much more detail than I have time to write about here. You can also subscribe to Teach 4 the Heart to get email updates whenever we post new tips and articles. Another fantastic book that helped me immensely is The First Days of School by Harry & Rosemary Wong. What has been your biggest classroom management struggle? What one change has helped you most? One of the things I implemented when I was still in the classroom was “thinking time”. I was in a school with a large culture where women were not really regarded as authority figures. (And even though this was offered as a tip to addressing behavior of minority students, I think it works really well for any teenager – they all appreciate respect). When a student was not meeting an expectation and disrupting class, I would remind them of the behavior and consequence. Then I would ask them to step out in the hall for a few moments and think about what they wanted to happen next. After a few minutes they were welcome to quietly come back and rejoin class or they could ask for an office referral. Most of the time, they would rejoin class and be great! Sadly, there are no meaningful consequences that the teacher can use. Suspensions have largely been, well…..suspended. And the kids know it. After the third or fourth stern “talking to” by the teacher and administrator, when nothing more than a recess has been taken away, they are smart enough to know that they can get away with just about anything short of violence–and sometimes even that. The attention that comes from disrupting the class is intoxicating for them. Add to the mix that minority students are often told at home that they should be on the lookout for racism from teachers at school. I see patterns of passive aggressiveness. All the great techniques in the world won’t take the place of parent support and courage from administrators, both of which have all but disappeared in many schools. Unfortunately, Anonymous, you are just about on target with all that. Sadly, it sounds negative and that there is no hope. However, there is hope…but, where to find it is the question. We educators know that there are excellent students and overall good classrooms. But, it is becoming more and more challenging to attain that great classroom due to the fact that most of the consequence options have been removed from the public education system. And who’s in charge of the public school system?…well, there you have it. I feel like I am in the wrong school. Students are not expected to take notes, but rather participate in learning activities all during class. We are a failing school that has issues from skipping, to back-talking, to no drive to do anything. There is no consequence I can offer that will scare or route my students, as administration will simply send them back to my classroom. As a new teacher, not only am I discouraged because the blame has been placed on me, but I feel like I am useless and unwanted.